The world around us is constantly changing. That’s a given. Some shifts cause an immediate and direct impact on our personal lives or our work. Others sneak up on us and have a more gradual but equally significant influence. If you’re responsible for your organization’s workplace wellness programs, you need to pay attention to both types of change. Shifts as disparate as new healthcare laws and new apps for smartphones are affecting the way workplace wellness programs are designed and implemented. Trends in nearly every aspect of life are changing the way wellness programs can engage your employees and bring greater value to your organization and stakeholders. 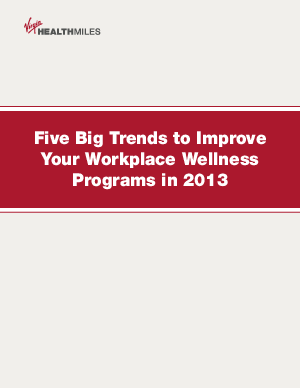 Virgin HealthMiles has been providing employee health programs since 2005. It currently serves more than 200 companies that, combined, have over 1 million employees. This paper illustrates five current regulatory, social and technological trends that are changing the world of workplace wellness programs — and how you can benefit from those trends.